The exact details of the agreement remain to be seen, and the timeframe will prove vital to its success or failure. It is clear, though, that having a firm policy helped the outcome. Lobbyists for the Iranian regime and advocates for appeasement toward the regime repeatedly state that taking a tough stance against the regime would lead to war. This is a false notion that denies the Iranian people the right to change the regime that is responsible for their oppression. Those who favor appeasement claim that regime change will lead to chaos and uncertainty. This deception, while impressive in its drama, is no longer effective. The time for appeasement has passed. First, unlike North Korea, the Iranian regime has the goals of expansion and exportation of terrorism and fundamentalism. They achieve these goals through the destabilization of other countries. This pillar of their survival is part of their constitution. Second, Iranian society, despite the regime’s efforts at suppression, is characterized by unrest, with a volatile population that protests daily for change. A nationwide uprising began last December and spread to 140 cities, with cries for regime change echoing across the country. Protests since then have been constant and widespread. Protests in Ahvaz and other cities in Khuzestan Province lasted over a week. 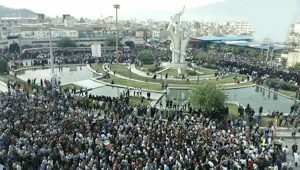 Farmers in Isfahan protested for days. Anti-regime protests even broke out at Friday prayer sermons, which are the regime’s official platform. 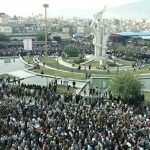 Massive protests in Kazerun basically led to the people controlling the city for almost a week this May. The regime was only able to regain control of the city after sending in additional security forces, killing at least four protesters, and making concessions to the protesters. A large-scale strike by truck drivers over the past two weeks has further destabilized the regime. The MEK has helped to organize all of these protests and to mobilize the people in protest. Third, Iran has a long history of fighting for democracy and freedom. The people of Iran are not strangers to fighting for regime change. Fourth, there is a viable alternative to the oppressive regime in Iran, which can both lead the movement for regime change and govern the nation during the transition after the regime is overthrown. The National Council of Resistance of Iran (NCRI), of which the MEK is the largest member, represents the aspirations of the Iranian people for freedom, and it represents and embraces people from all political identities and religious and ethnic minorities. A firm policy toward Iran would prevent the regime from taking advantage of the past policy of appeasement by the West that has allowed the mullahs to flourish for decades. Currently, the Iranian economy is on the brink of collapse, and trade will not save it, even from its traditional allies. Establishing a firm policy toward the Iranian regime while siding with its people is indeed the only way to prevent war and to move toward peace in the region. The people of Iran and their resistance movement, specifically the MEK, are equal to the task of regime change. The task of the world’s governments is to abandon the policy of appeasement toward Iran and create a firm policy that will make a lasting peace.